It wont be long before the surf fishing for pompano will be happening. As a kid Tom Roney and I used to frequently surf fish. We caught lots of whiting, reds, trout, catfish and some things that we never even got a glimpse of before they either ran all of our line out or broke us off. We primarily targeted whiting because they were easy to catch, they ate real good and we could use our bream tackle (ultra light spinning tackle) to fish for them. Maybe that's why we lost the big fish that took our offerings of shrimp on our small outfits. We used to go to Ponte Vedra Beach and walk out into the surf about knee deep and cast our small rigs along the surf. We even occasionally caught a pompano. From now until the middle of December, the pompano that made the run north in the spring are now headed south and they come right down our coast. Let's start with baits that work for Pompano. Clams; You can purchase these at most seafood markets. Shrimp; Live ones wok better than dead ones, try using the head part. Pull the shell off of the head, leaving the legs and innards. Sand Fleas; You have to catch these. You are going to need a sand flea rake and a bucket. Sand fleas are on the beach just at the waters edge. Take your rake and scoop up the sand as the wave is going back out. Some of the best places to get fleas are south of St. Augustine to Marineland. To do this you need and outgoing tide, this seems to be the best tide for getting fleas. You take your sand flea rake and drag it in the sand, in about 12 inches of water, just as the waves move back out to sea on the beach. If you were in the correct place and there were any fleas there, you should have a few in the bottom of the rake. This might take some practice, so I would suggest that you take your rake and a five gallon bucket and go to the beach and practice before you have a full blown day of trying to pompano fish, without fleas. If you catch any while practicing, put them in the bucket with about eight inches of sand and your fleas will stay alive for several days if they do not get too cold or too hot. Next go to a craft shop and get some beads, like the ones that come in the trout float package. You will need some red and some yellow ones. You will also need some Daichii #1 to 1/0 Circle Wide hooks, a thick wall pvc rod holder for each rod, a piece of wood and a big hammer. The wood is to put on top of the pvc rod holder, so when you beat it in the sand with the big hammer you won't tear it up. Your rod and reel outfits should be ones that will allow you to cast about 50 yards (1/2 the length of a football field). I like the Shakespeare surfcasting rods in the 11 foot length and the Tidewater reels that will hold about 225 yards of 50 pound test Power Pro braided line. The reason that I use braided line is it is very abrasion resistant and it is smaller than monofilament, so you can more on the spool. The rig that I have found to work, consist of a 30 to 50 pound test barrel swivel tied to the Power Pro using a Palomar knot, from there tie on a piece of 25 to 40 pound test monofilament, about three feet long. Go down from the swivel and tie a loop knot that has the loop sticking out about six to eight inches, then another about six inches down from the first, the another about the same distance down and the one more at the end of the line. Take a yellow and a red trout float bead and slide them on the loop knots, then put the loop knot through the eye of a Daichii #1 to 1/0 Circle Wide hook. Do this to the first three loop knots. on the last loop knot, slide it through a pyramid sinker, 4 to 6 ounces. Take your sand fleas, running the hook through the bottom and coming out of the center. Do this to each hook, one flea to the hook. Walk down to the surf and cast it as far as you can straight out, then place it in your pvc rod holder. Your cast will usually need to be about 70 to 100 yards long so you might have to practice a few times before you get this down. Most of us are not used to throwing a piece of lead the weighs so much and throwing it so far. When one of these bad boys eats your flea and is hooked up, there will be "NO DOUBT" that you have a fish on. Your rod tip will be bouncing and bending. Some of these fish put up quite a fight and you might have to walk them down the beach before landing him. You will also catch whiting, reds and many other things while fishing for pompano. You can keep 10 of these per person and they have to be between 10 and 20 inches at the fork. Go ahead and purchase three outfits, as you can fish three rods in Florida and the more baits that are in the water the better your chances are of catching fish. Other places to try are the North Beach in St. Augustine, Nassau Sound, just north of Jacksonville, and Fort George Inlet. These fish are caught from the Carolinas to south Florida and the majority are caught in the surf, so get out there and catch us some. 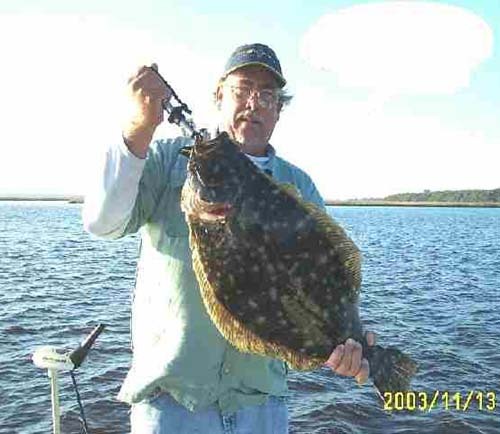 There are a few winter flounder being caught and most are pretty nice. The trout are everywhere. Try a MirrOlure surface lure on calm conditions or a diver if you have a chop on the water. I like the edges of grass banks or islands, rock ledges or around big points. The sheepshead have slowed way down, maybe the cold we are getting this week will motivate them again. Still no black drum, but they should be here any day now. Look for them around the inlets and rock ledges. Reds in the backwater are still fired up and can be caught on shrimp, mullet, soft plastics, crab or cut bait. Lure fishing is best on the higher end on the incoming and first of the outgoing tide along the edges. Lots of whiting in the surf and inlets. Try shrimp for these tasty little guys. This is a good species for you kids to try as they are usually here in good numbers and are easy for kids to catch. The offshore waters are producing record catches of snapper and grouper along with nice seabass and vermilion snapper. Don't forget to check out my website for other information on fishing this area and charter info at www.hammondfishing.com/. Capt. Jim's Fun Fishing Inc.